When I moved into this house 2 1/2 years ago I inherited a large chest of drawers at the same time. I remember thinking to myself as I was unpacking “I can’t possibly need all these t shirts, surely nobody can justify more than 14 t shirts at an absolute limit, that’s one every day for a fortnight”. I think I might have taken a couple to the charity shop but I certainly haven’t had a proper clear out. The keepers (although the spottty dotty top has been moved to the mending pile as it drastically needs de-tenting) – I let myself keep one old scruffy one (for painting), and two that are a little on the tight size but long enough that I really love. So, without further delay, I decided to make a start. 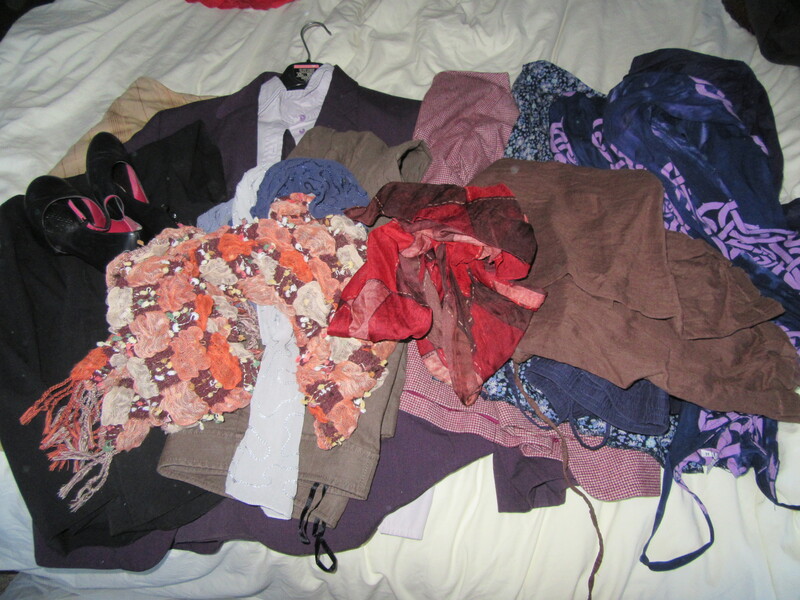 I might not make it all the way through my clothes to the further reaches of piles of scarves etc as suggested, but I can certainly make a dent. 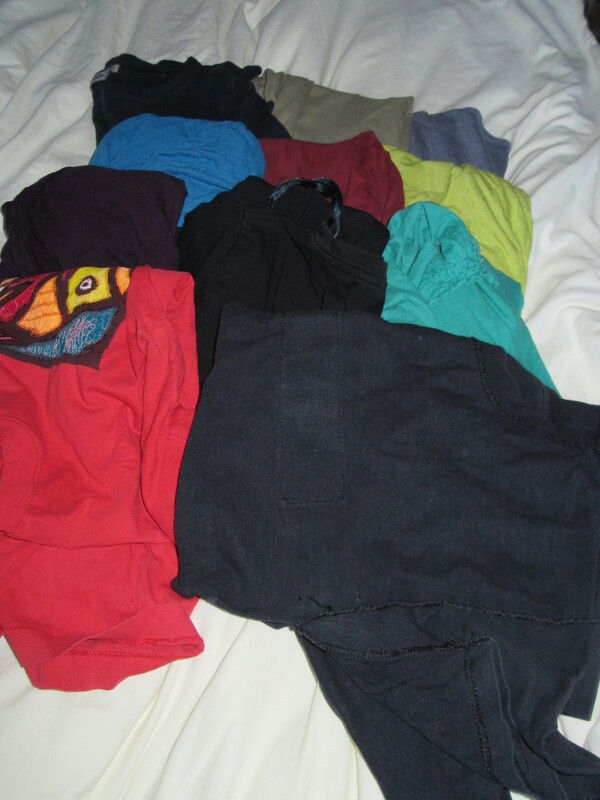 And first to go are the t shirts I no longer wear now that I can make ones that are long enough! (the days of worry over flashing my muffin top to the world and the resultant constant checking and tugging are happily a thing of the past for me). I didn’t have a system. I just put them into two piles, keep or go. Fairly quickly, based on my gut thoughts. Then double checked before bagging up the losers and placing the rest back in my drawer (a lot more neatly as I didn’t have to stuff them in as much). 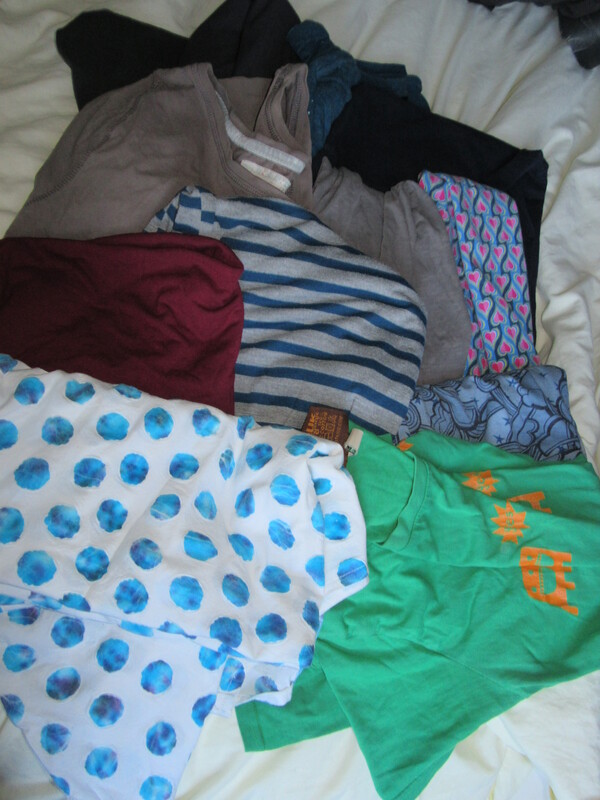 It proved pretty addictive as I then went through my wardrobe and came up with this lot, some of which were given to me when my friend had a clear out a while ago and I’ve never worn. The purple suit was hard to let go of, I love that suit. But I don’t wear suits any more and I decided I was better of keeping my slightly larger grey suit as the trousers don’t do up on this one any more. I just imagined some hard up person stumbling upon the lovely purple suit in the charity shop and clinching themselves a bargain and then wearing it lots. I’ve stopped for now as if the bag by my front door gets any bigger I won’t be able to carry it! This entry was posted in Uncategorized and tagged #thegreatclosetpurge2015, clearout, closet, great, purge, wardrobe. Bookmark the permalink. I’m not taking part as my wardrobe is in a continuous state of being purged, but I know it’s a great idea if you haven’t done it. A number of years ago now I realised I was hanging on to lots of stuff I didn’t wear, and did a massive clear out. Now if I put something on, it feels less than great, doesn’t fit, or is stained or ripped, it goes out straight away – either to be altered/repaired or charity/recycle. It has made getting dressed so much easier. The only downside is I have to keep on top of the laundry! !